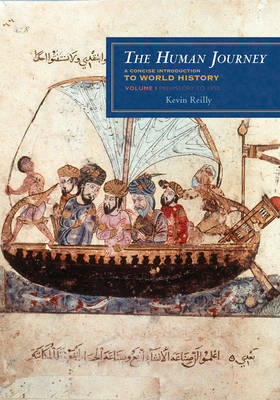 The Human Journey offers a truly concise yet satisfyingly full history of the world from ancient times to the present. The book's scope, as the title implies, is the whole story of humanity, in planetary context. Its themes include not only the great questions of the humanities-nature versus nurture, the history and meaning of human variation, the sources of wealth and causes of revolution-but also the major transformations in human history: agriculture, cities, iron, writing, universal religions, global trade, industrialization, popular government, justice, and equality. In each conceptually rich chapter, leading historian Kevin Reilly concentrates on a single important period and theme, sustaining a focused narrative and analytical perspective. Chapter 2, for example, discusses the significance of bronze-age urbanization and the advent of the Iron Age. Chapter 3 examines the meaning and significance of the age of "classical" civilizations. Chapter 4 explains the spread of universal religions and new technologies in the postclassical age of Eurasian integration. But these examples also reveal a range of approaches to world history. The first chapter is an example of current "Big History," the second of history as technological transformations, the third of comparative history, the fourth the history of connections that dominates, and thus narrows, so many texts. Free of either a confined, limiting focus or a mandatory laundry list of topics, this book begins with our most important questions and searches all of our past for answers. Well-grounded in the latest scholarship, this is not a fill-in-the-blanks text, but world history in a grand humanistic tradition.